Our period can often leave us feeling bloated, irritable, and all around uncomfortable! The foods we eat during our period often contribute to how we feel emotionally and physically. 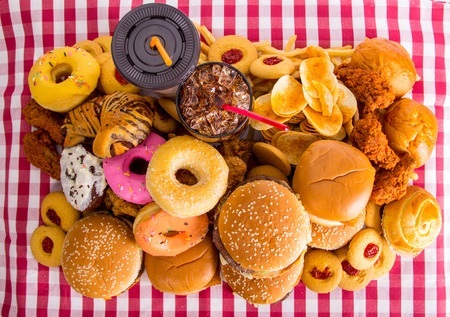 If we eat foods that aren’t good for us, we aren’t likely not going to feel good afterwards. There are several foods that you should do your best to limit or avoid during your period. I’m sorry to disappoint all of you caffeine addicts, but caffeine is not ideal for women that are menstruating. Caffeine, which is most often consumed through coffee, can contribute to major period issues. Some women can experience irregular periods due to significant caffeine consumption. Other women might suffer from more severe menstrual pains, diarrhea, and inability to sleep. Yikes! Instead, consider drinking lots of water and non-caffeinated teas or a teas with very little caffeine. If you find yourself craving a large cheeseburger, a huge bowl of ice cream, or a greasy bacon breakfast sandwich during your cycle, think twice before you take a bite! These foods can take a major toll on your hormones which are already raging during your cycle. Hormonal changes can contribute to breast tenderness or bloating—two things we’d all prefer to avoid. Do your best to consume fresh produce, fish, and lean meats instead. From baked goods to chocolate bars, most women spend a good amount of their cycle craving a variety of sugary indulgences. However, sugar-filled foods alter your blood sugar levels which can result in significant mood swings. They can also result in fatigue as you continuously crash once the sugar-high is gone. As an alternative to that big piece of cake, do your best to eat fruit flavored yogurt or a fresh fruit salad instead. You should try to avoid these three food groups in order to give yourself a more comfortable time of the month. Not only will you be helping yourself, you’ll be making healthier food choices too! For natural period relief, use Comforté instead.